Hurricane Jeanne tore a fresh path of destruction and despair as it marched up storm-ravaged Florida, where the fourth major hurricane in six weeks shut down much of the state and prompted recovery plans on a scale never before seen in the nation. At least six people died in the storm, which plowed across Florida's midsection in a virtual rerun for many residents still trying to regroup from hurricanes that have crisscrossed the Southeast since mid-August. "Once again, we're facing a hurricane/tropical storm that's just wreaking havoc wherever it goes," Federal Emergency Management Agency director Mike Brown told CBS News' The Early Show. "We have some people in Florida who have been hit two or three times now by these hurricanes. They have to be miserable right now." "Everything's been hunky-dory until this year, and everything's gone to pot," Fort Pierce resident Wanda Dryden told CBS News. High temperatures Monday have state health officials worried about cleanup crews and residents. "This is a time for every citizen to be extremely cautious, to go about the process of cleanup with great care, avoid overexertion," said state Secretary of Health John Aguwonobi. Rocketing debris scattered in earlier storms, Jeanne came ashore around midnight Saturday with 120 mph wind, striking its first blow in the same area hit three weeks ago by Hurricane Frances. It remained at tropical storm strength with winds of 45 mph when its center moved over Georgia on Monday morning, but was expected to weaken into a tropical depression later in the day. 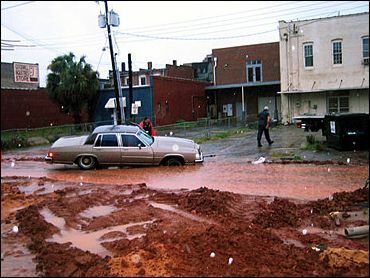 It had moved east of the Panhandle, where 70,000 homes and businesses remained without power because of Hurricane Ivan less than two weeks ago. Officials say it could be 3 weeks before power is fully restored, assuming Florida isn't hit again. It's a gamble Gloria Barto doesn't want to take. "I'm packing up my things. I don't know where I'm going, but it's not going to be Florida," Barto said. Mobile home parks throughout Florida suffered the most damage — again, reports CBS News Correspondent Sharyn Alfonsi. Wind cut through thousands of homes; water finished off hundreds more. Jeanne ripped off roofs, left stop lights dangling precariously, destroyed a deserted community center in Jensen Beach and flooded some bridges from the mainland to barrier islands straddling the Atlantic coast. About 2.6 million homes and businesses were without power. "As bad as the rain was on the coast, it was less significant inland, but the ground here is already so soaked there's simply no place for the water to go," reports CBS News Correspondent Lee Cowan. Florida was the first state to withstand a four-hurricane pounding in one season since Texas in 1886 — a milestone that came with two months remaining in the hurricane season. "We fix it and nature destroys it and we fix it again," said Rockledge bar owner Franco Zavaroni, who opened his tavern to seven friends who spread mattresses on the floor among the pool tables to ride out the storm. "My heart goes out to these people," said FEMA's Brown. About 50 homes in Valdosta, Ga., in the south-central part of the state, were evacuated early Monday because of flooding. Jeanne was dumping about 6 inches of rain on the area, according to the National Weather Service. "These people were asked to evacuate because of the impending danger of flood and that some of homes had flooded. We don't believe anybody had to be rescued," Lisa Ray, spokeswoman for the Georgia Emergency Management Agency, told CBS Radio News. "The Valdosta area got 4-6 inches in some areas and the rest of the day, we're anticipating localized flooding. We had a number of tornadoes sighted last night, but none fortunately touched down to cause major damage." Georgia Power reported about 60,000 customers without power Monday morning. About 760 people stayed in the 24 Red Cross shelters had set up Sunday night, said Ray. Brenda Summers evacuated her mobile home in Albany, Georgia and is being housed at a Red Cross shelter in Albany. "Our home is up to code but you never know. Mean Jeanne, she is mean, so she's throwing some gusty winds. So I hope our home is sturdy enough to hold some gusty winds," Summers told CBS Radio News. She said it's tough waiting in the shelter. "Is your home going to be same shape that it was when you first left it. You're wondering, is your family, neighbors and friends OK? There's a lot of emotions that's going around," Summers said. President Bush declared a major disaster area in Florida while officials with FEMA said the hurricanes represented the largest relief effort in the agency's history, larger than the response to the 1994 earthquake in the Northridge section of Los Angeles. "We just somehow have to get as much relief to them as possible to show them that we're going to be right there with them, that we haven't abandoned them," said Brown. Charley was a faster storm when it hammered Florida's southwest coast Aug. 13; Frances blanketed much of the peninsula after striking the state's Atlantic coast Sept. 5; and Ivan blasted the western Panhandle when it made landfall Sept. 16. The three storms caused billions of dollars in damage and killed at least 73 people in Florida alone. Jeanne was a Category 3 hurricane when it made landfall at Hutchinson Island, 35 miles north of West Palm Beach — almost the same spot that Frances struck. Once inland, the 400-mile wide storm stretched across the state, passing northeast of Tampa and moving east of the Panhandle. Officials at the National Hurricane Center in Miami said the similar paths of Jeanne and Frances were possibly unprecedented. Most counties in South Carolina's northeast corner were under a flood watch, and the U.S. Weather Service placed much of southern Georgia under a tornado watch. Some school districts in both states called off classes Monday. Earlier, Jeanne tore across the Bahamas, leaving some neighborhoods under 6 feet of water. The storm caused flooding in Haiti that killed more than 1,500 people.